An influential US Congressman has said the United States stands with the Bangladeshi people seeking free, fair and safe democratic elections but cautioned that Islamist groups like Jamaat-e-Islami pose a great threat to the country’s democracy and progress. 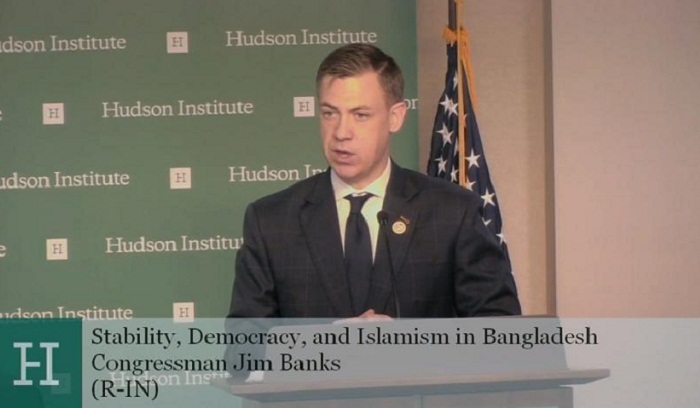 “Bangladesh is a young democracy that struggles with radical groups attempting to subvert Bangladesh’s progress all while seeking political power for themselves,” Congressman Jim Banks (R-Indiana) told a discussion in Washington on Wednesday, according to a message received in Dhaka on Friday. Hudson Institute arranged the discussion on “Stability, Democracy, and Islamism in Bangladesh”, where it convened a panel to discuss politics in Bangladesh and the country’s upcoming elections. Panelists included Liberty South Asia’s Seth Oldmixon, the Middle East Forum’s Sam Westrop, and Abha Shanker of the Investigative Project on Terrorism. The panel was moderated by Ambassador Husain Haqqani, Hudson Institute director for South and Central Asia programing. In his opening remarks, Congressman Banks who recently introduced a bipartisan resolution in the House of Representatives said these violent theocratic groups have committed violent acts against religious minority Christians, Hindus, Buddhists and moderate Muslims in an attempt to silence their voices and discouraged them from participating in a democratic process. Banks said Gano Forum President Dr Kamal Hossain earlier had stated his party will not join Bangladesh Nationalist Party (BNP) if Jamaat remains part of it. The congressman said the United States should support the efforts of Bangladesh government to combat the radical Islamist groups and to reaffirm the rights of the religious minorities. Banks said the resolution he introduced has called on the USAID and the US State Department to refrain from any partnership or any funding arrangement from any organizations affiliated with radical Islamist groups in Bangladesh. He recalled that previous elections have been the breeding grounds for these violent radical groups who have committed hundreds of acts of violence against religious minorities, minority-owned businesses and houses of worships. Banks said Bangladesh is a majority Muslim country that has an overwhelmingly positive view of the United States. Quoting a recent PEU opinion survey, he said 76 percent of those in Bangladesh have a positive view of the US. He said Bangladesh shares critical strategic partnership with US In July 2017, the US and Bangladesh leaders dedicated multipurpose training facilities for Bangladesh Institute for peace support training operations. The US has provided $ 3.6million to facilitate training to peacekeepers deployed for the UN peace mission. The congressman praised Bangladesh as one of the largest contributors of military personnel to the UN machines, playing a vital role in security cooperation. Keeping in mind the upcoming elections in Bangladesh, Banks said in a few weeks, the world will watch the elections on December 30. “The US stands with the people seeking free, fair and safe democratic elections and religious freedom,” he added.